On March 11, 2013, the Securities and Exchange Commission charged Illinois with securities fraud. The SEC accused the state of misleading investors by understating the depth of the pension crisis. Let’s decode the SEC’s insider speak. The statutory plan is the current law — also known as the Edgar pension ramp. When the Edgar ramp passed, it was hailed as the bipartisan compromise that would fix the state’s pension problem. By design, the “ramp” backloaded the majority of the state’s pension contributions — the goal being to stabilize the system and reach 90 percent funding by 2045. The following chart to show what has happened as a result of the Edgar ramp. The chart highlights the unpredictable nature of defined benefit plans and the failure of the Edgar ramp. 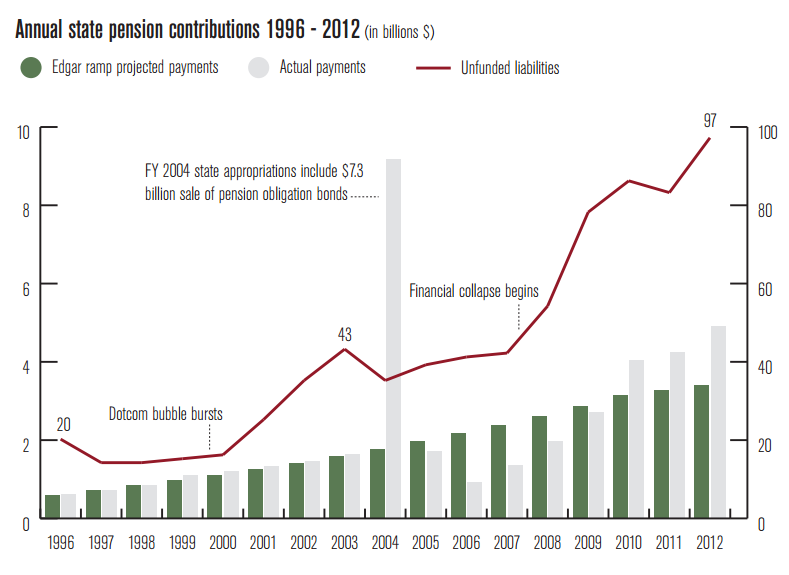 Several factors contributed to the growing unfunded pension liability, including missed investment returns, underfunding, worker pay hikes, benefit increases and mistaken actuarial assumptions. These factors create massive uncertainty for future budgets. For example, when the ramp was created, Illinois’ fiscal year 2014 pension contribution was projected to be $3.7 billion. The actual contribution for fiscal year 2014 will be $6.8 billion — nearly twice as much as what was predicted. Even more disturbing is the fact that taxpayers have pumped $8 billion more into the pension system than the original pension ramp called for. Unfortunately for workers and taxpayers, lawmakers are looking to repeat the mistakes of the past and replace the Edgar ramp with the Cross-Nekritz ramp. Only this time, lawmakers want taxpayers to guarantee their plan in order to appease union bosses. The Institute’s plan actually solves the pension crisis by moving away from the unpredictable, defined benefit model and replacing it with a stable, 401k-style plan. Today, more than 10,000 Illinois government workers participate in a 401(k)-style plan that puts them — not politicians — in charge of their retirement. This plan is not only secure, but it also immediately cuts the state’s unfunded liability by nearly half and eliminates the unfunded liability by 2045. What’s more, our plan replaces the irresponsible ramp with level annual payments.